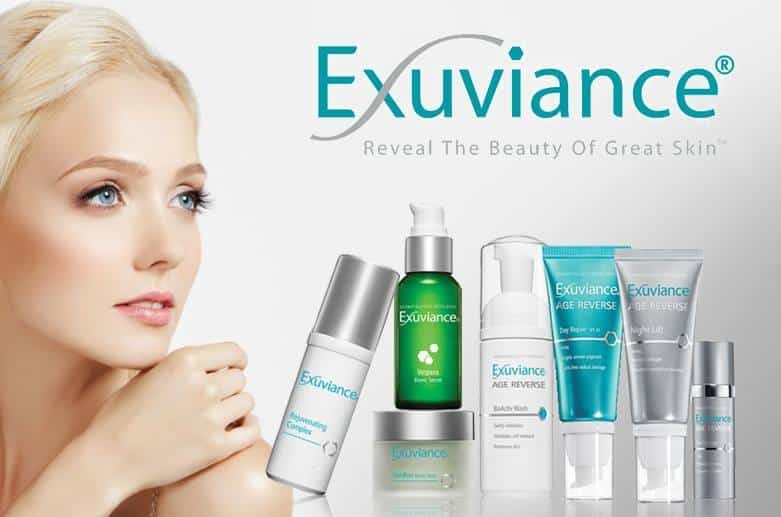 Exuviance Professional Facial Peels are a versatile, safe and highly effective skin rejuvenating treatment for addressing a number of concerns, including acne, scarring (including acne scars), sun damage, melasma, hyperpigmentation, uneven skin tone, fine lines and wrinkles, dullness, congested pores, and rough skin. Exuviance Professional Facial Peel Treatments contain the most contemporary blend of Alpha Hydroxy Acids (AHA’s), Poly Hydroxy Acids (PHA’s) and Bionic Acids which not only work on the skin’s surface to exfoliate dead, dull surface layers, they also stimulate the process of cell renewal among all layers, to reveal fresher, firmer healthier skin. 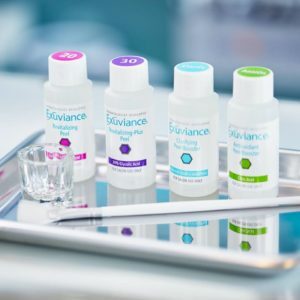 Exuviance Professional Facial Peels have been carefully formulated to deliver visible results, giving skin remarkable vibrancy. Even at lighter strengths, the facial peel will be accompanied by mild to moderate redness – a healthy glow! This will subside within a few hours. While the treatment is well-tolerated, some flaking of the skin is also to be expected as dead skin cells are sloughed away to give way new fresher younger skin. SPF is mandatory post-peel. Before your treatment a full consultation will determine the most suitable peel for your particular skin type and skin concern. Radiance Revitalising Peel – A peel that brings new life to dull, stressed skin and restores youthful radiance, suppleness and clarity. Age Reverse Peel – This peel addresses all signs of ageing including fine lines, wrinkles, poor texture, uneven skin tone and loss of firmness. Clarifying Pore Refining Peel – This peel clarifies acne-prone, blemished skin and minimises the appearance of oiliness and enlarged pores. It perfectly cleanses the skin, unblocks clogged pores and helps with post acne healing process. Six treatments are recommended every three weeks. OptiLight Brightening Peel – A brightening peel dedicated to skin with pigmentation and hyper pigmentation. Each session gradually brightens the skin and brings more even skin tone and a healthy glow. Calming Sensitive Peel – A very gentle peel that visibly calms and soothes sensitive and rosacea prone skin while correcting signs of ageing. Ultra-Hydrating Peel – A peel that intensely hydrates dry lackluster skin. Plumps lines and wrinkles and restores radiance and texture.